The OK is always at the forefront of merging technology with kosher certification. From computerized product and ingredient data storage, to online access to thousands of kosher certificates, the OK takes pride in its high tech, user-friendly kosher database. Recently, we have taken technology a step further and put our full product list in the palm of your hand! The OK’s complete product list (both industrial and consumer) is now available for the iPhone, iPad & iPod Touch. The OK Kosher Food Guide App (free in the iTunes store) enables you to search the extensive database of OK certified products by company name or category and have the kosher information at your fingertips, including Cholov Yisroel, Pas Yisroel & Yoshon status! The guide is automatically updated daily to give you the most up-to-date information. 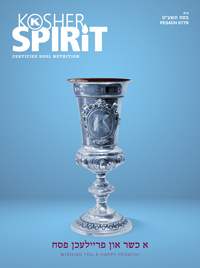 Other great features include a direct link the OK website and current and past issues of Kosher Spirit magazine, as well as the link to download our popular Vegetable Checking Guide app. You can also use the app to suggest new kosher products to the OK.
We are currently in the process of developing an Android version of the app, which we hope to unveil in the coming weeks! *The OK was recently featured on the front page of the Wall Street Journal. We are told that Rabbi Chaim Fogelman, Director of Marketing & Eduction and Editor-in-Chief of Kosher Spirit, is only the second orthodox rabbi to ever grace the cover of this prestigious paper. Rabbi Naftali Marrus kosherizes a restaurant kitchen for Passover. When Rabbi Naftali Marrus does his spring cleaning, he doesn’t use a mop. He rolls with the Inferno. 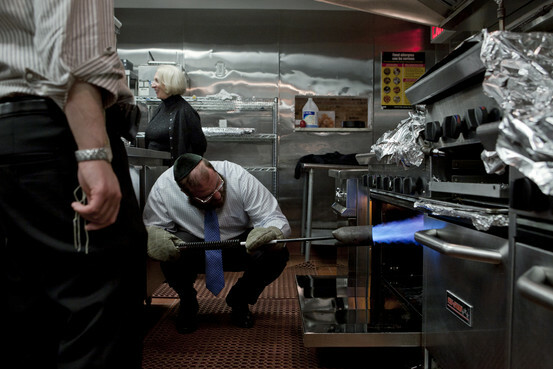 The Inferno is a three-and-a-half-foot-long propane torch Rabbi Marrus uses during the critical days before Passover to scour commercial kitchens catering to observant Jews and obliterate the smallest particles of bread and other leavened foods, which are forbidden during the holiday that commemorates the Jews’ flight from Egypt. Marching into the kitchen of My Most Favorite Food, a restaurant on Manhattan’s Upper West Side, Rabbi Marrus runs his finger along stove tops, pokes his head inside the big industrial ovens, examines the coffee maker and inspects walls and floors. They have been soaked in boiling water and scrubbed clean with soap, detergents, degreasers and ammonia. Rabbi Marrus, 6-feet-3-inches tall and built like a football player, handles the Inferno with care. “You have to be respectful to the blowtorch,” he says. Passover, which starts Monday at sundown and lasts eight days, is the busy season for Rabbi Marrus. As a supervising rabbi for OK Kosher Certification, an agency in Brooklyn, N.Y., he and his colleagues are working 24/6—they don’t work on the Sabbath—to ensure that all restaurants, caterers, cafés, industrial kitchens and food manufacturers that want the OK Kosher for Passover label follow strict Jewish food laws. But keeping kosher isn’t just for Passover, and it isn’t just for traditional Jewish food. OK gives its kosher blessing to items as varied as Perrier water and Tropicana orange juice. Getting the kosher seal is a rigorous experience that requires OK’s 300-odd part-time rabbis to travel around inspecting plants where food is produced. They study every ingredient that goes into a product to make sure it conforms with religious law. Only then will they allow it to carry their trademark “K” with a circle around it. “We like to say God is our silent partner,” remarks Rabbi Chaim Fogelman, an OK veteran. OK Kosher started in about 1935 as a mom-and-pop shop called Organized Kashrut Laboratories. It’s now a multinational player, with rabbis in China, Japan, India, Belgium and Israel who certify nearly 500,000 products from about 3,000 companies. Its headquarters are still in Crown Heights, Brooklyn. It operates as a nonprofit. Clients pay from $2,000 to tens of thousands of dollars annually. Kosher dietary laws date back to biblical times. Several basic laws come with hundreds, even thousands of regulations or interpretations. Eating pork and shellfish, for example, is banned, while mixing meat and milk is also taboo. There are also intricate rules on how an animal must be slaughtered to produce kosher meat. Establishments that serve kosher food, including restaurants, cafés, catering halls and butcher shops, need to have a mashgiach on hand, an on-site supervisor, typically a rabbi, assigned to stand around and watch, guarding against treif or unkosher ingredients that could slip in. The U.S. kosher market is valued at about $12.5 billion. “The iconic brands of America are overwhelmingly kosher,” says Menachem Lubinsky, President of Lubicom Marketing Consulting. Familiar brands such as Coca-Cola, Snapple, Philadelphia cream cheese, Coors beer and Tootsie Rolls all have products with a kosher label. These days, more than 1,000 agencies world-wide vie with one another to bestow on products an alphabet soup of kosher insignia. These include the ubiquitous k with a circle around it favored by OK; there’s the OU—a U inside a circle—sign used by the Orthodox Union; while the Rabbinical Council of Chicago is known for its cRc in a triangle stamp. There are occasional disagreements, and what is kosher to some rabbis may not be to others. Ms. Fishkoff, for instance, recalls how the granddaddy of kosher products—the iconic Hebrew National Kosher Hot Dog—for years wasn’t considered sufficiently kosher by some of the key certifying agencies. These days, armed with a kosher seal from Triangle K, a Brooklyn agency, the hot dog has been embraced by Conservative Jews who observe kosher dietary laws. Some Orthodox agencies such as OK and the Chicago Rabbinical Council still reject it. “It is much better than it used to be,” says Rabbi Fishbane, but “it is not certified glatt,” he says, referring to an even higher standard of kosher meat certification. For Hebrew National to be certified as glatt, Rabbi Fogelman says, it would have to use only glatt kosher meat. Glatt certification, he explains, involves checking a cow after slaughter to see how healthy it was—specifically if it had lesions on its lungs. If it had too many lesions, then it won’t pass muster as glatt, he says. Hebrew National, owned by ConAgra Foods, says on its website that its certification by Triangle K comes from an orthodox Jewish agency made up of “the most stringent Jews” that provide rabbinical supervision and make sure its products and ingredients meet the “strictest criteria” for kosher. ConAgra’s spokesman says it has no plans to pursue the glatt market. Then there’s the question of how far to push the kosher brand. Rabbi Fogelman of OK says his agency has been asked to certify paper bags as kosher; OK is working on it. OK certifies a dog treat as kosher. Exclusively Pet Inc., in Milwaukee, manufactures dog cookies that carry the little K seal. These days Evanger’s Dog & Cat Food Co. near Chicago sells dog and cat food that, in a manner of speaking, is kosher. They are deemed usable during the Passover holiday, though not kosher for human consumption, and have the endorsement of the venerable Chicago Rabbinical Council. Evanger’s website touts its products by showing a photo of a dog wearing a yarmulke. *Reprinted from the Wall Street Journal, April 18, 2011.